There are some fantastic books for children and teenagers on the way in 2017, including a picture book from the dream team of Julia Donaldson and Helen Oxenbury and the second in Dave Rudden’s exceptional Knights of the Borrowed Dark fantasy adventure series. The Bookseller magazine, the bible for the book trade sees ‘Middle Grade’ (age 9+) books as a big trend for 2017 and there are certainly some strong books for this age group coming through, including See You in the Cosmos by Jack Cheng (Penguin Random House Children’s, March) the story of an eleven year old boy who wants to launch his iPod into space to talk to other lifeforms; and Fish Boy by Chloe Daykin (Faber, also March), a beautifully written debut about a lonely boy who is obsessed with swimming. January sees the publication of Wing Jones by Katherine Webber (Walker Books), a novel about identity, family and running for age 12+; and Julian Gough and Jim Field are back with Rabbit and Bear: The Pest in the Nest (Hodder), another funny, noisy adventure for early readers. There’s been a lot of talk about Wed Rabbit by Lissa Evans (David Fickling), the story of ten year old Fidge and her spoilt cousin, Grahame who find themselves in a magical world that looks strangely like the picture book Fidge reads to her little sister at bedtime. Also January. Sarah Crossan and Brian Conaghan’s We Come Apart (Bloomsbury) is a key title in February, a novel in free verse about Romanian teen, Nicu and English girl, Jess. For younger children, Lucy Cousins is back with a vibrant new picture book, A Busy Day for Birds (Walker Books); and Cass and The Bubble Street Gang: The Clubhouse Mystery by Erika McGann (O’Brien Press) sounds fun for young readers of age 7+. Also from an Irish publisher, this time Little Island Books, is A Dangerous Crossing by Jane Mitchell, the story of a boy fleeing from Syria. Age 11+. Fast Forward by Judi Curtin (O’Brien Press) is being published for World Book Day on the 2nd March for age 8+; and also in March, The Space Between by Meg Grehan (Little Island) is a love story in verse for teenagers about friendship and mental health. Grehan is only twenty-four and this is her first book. Gill Books have the Naturama Nature Journal for budding naturalists, by Michael Fewer and illustrated by Melissa Doran. The Forever Court, book 2 in the Knights of the Borrowed Dark series by Dave Rudden, (Penguin Random House Children’s) is coming in April featuring battles in ‘quiet Dublin bookshops’. Also in April, We’re All Wonders by RJ Palacio (Penguin Random House Children’s) sees the return of Auggie from the original novel, Wonder which has sold over five million copies worldwide. There is a movie of Wonder coming in 2017 so expect a lot of noise around this new book too. And finally in April, The Hate U Give by Angie Thomas (Walker Books) is getting a lot of pre-publication attention both here and in the US. Inspired by the Black Lives Matter movement, it’s a YA novel about prejudice in the 21st century. In May we have Keepsake by Paula Leyden (Little Island), about two children and their race to save their beloved horse, Storm. Age 8+. June sees the return of Derek Landy’s hugely popular Skulduggery Pleasant series with book ten in the series (Harpercollins); and Moira Fowley-Doyle’s new book, Spellbook of the Lost and Found, about six Irish teenagers who find a sinister book. In August we have The Guggenheim Mystery by Robin Stevens (Penguin Random House Children’s), the sequel to the London Eye Mystery by the late Siobhan Dowd, a clever way of keeping Dowd’s work alive. September sees the return of feisty heroine, Ebony Smart in The Book of Revenge, the last book in the Nine Lives trilogy by E R Murray (Mercier); and Tangleweed and Brine by Deirdre Sullivan and illustrated by Karen Vaughan (Little Island) takes Cinderella and other tales and gives them a ‘dark, witchy makeover’. Perfect for the lead up to Hallowe’en. Sarah Webb writes for both adults and children. Her new poetry and rhyme collection for children, A Sailor Went to Sea, Sea, Sea, illustrated by Steve McCarthy will be published by O’Brien Press in the autumn. She is currently Writer in Residence for Dún Laoghaire/Rathdown. He gave a fantastic workshop – thanks, Dave! Up next is Oisin McGann – more about that session next month. The Lexicon Library hosted a Roald Dahl themed Family Day on 8th October and over two thousand children and adults enjoyed workshops, comedy shows and the Great Big Dahl Show with Grainne Clear, Dave Rudden, Stephen James Smith and Enda Reilly. The young writers visited the Municipal Gallery in the Lexicon and wrote short pieces about some of the art works. We talked about the art and how it made us feel. It’s a wonderful exhibition called Lines of Negotiation and is all about our relationship with the landscape. It runs until 5th November and is well worth seeing. I managed to catch Library Voices with Margaret Atwood in the Pavilion on Sunday 9th October. My friend, Bert Wright (also my co-curator on the Mountains to Sea dlr Book Festival) programmes these wonderful events. The Patrick Kavanagh one man play in the Studio in the Lexicon was also most interesting. I was back in Dalkey for Baby Book Club and we made these spooky ghosts with cotton wool. Our theme: Hallowe’en of course! Next Baby Book Club is Monday 21st November at 10.30am in Dalkey Library. The drop in writing clinics are proving very popular and I talked to many writers, young and old this month about their work. It’s great to see so much creativity happening in Dun Laoghaire! We are now taking bookings for the clinic on Wednesday 30th November. Email dlrlexiconlib@dlrcoco.ie to book a place. 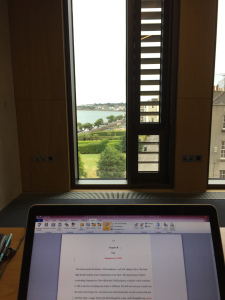 The Writer in Residence podcasts are now up on the dlr libraries website – do take a look! Watch me talk to Eoin Colfer and Marita Conlon McKenna about their work, and recommend some of my favourite children’s books. I spent a few days in Limerick helping run the literature strand of this great children’s festival. We held talks and workshops by Margaret Ann Suggs, Shane Hegarty, Grainne Clear, Derek Landy, Patricia Forde, Dave Rudden and local writer, Judi Curtin. It was a fantastic trip. In 2017 my poetry and rhyme collection, A Sailor Went to Sea, Sea, Sea will be published by O’Brien Press. It will be illustrated by Steve McCarthy and I will be working on the final selection and the edits during my time as Writer in Residence. And finally, I wrote a picture book this month all about puddles. It was inspired by gazing out my Writer in Residence window one very rainy day! I believe that the act of writing a book, with all its steps – from the very first germ of an idea, to thinking about the characters and plot, to writing the first draft, to re-writing and working on it again and again - helps build resilience in children and teens. 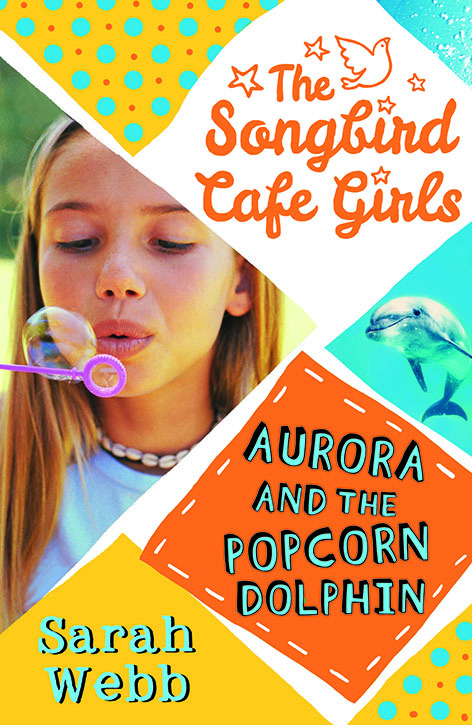 This blog also appeared on the Girls Heart Books website - an excellent website for readers of age 8 to 14. Yesterday I attended a conference in the National Library all about book festivals and how festival organisers and programmers can support writers. At the event it was generally agreed that e300 was a fee for festivals to aspire to, although for panel events and smaller festivals this may not be possible. Only 10% of writers make a full time living from writing and writing associated work (events etc). 5/ Writers should NOT have to provide and sell their own books at festivals – it is up to the book festival to arrange this. Argosy Wholesale can help provide books. Or ask Poetry Ireland or Children’s Books Ireland for advice. 6/ A good chair or moderator is vital to a successful panel event. Programmers should be inventive when pairing up artists. Joanne Harris suggested pairing up interesting writers – herself, Neil Gaiman and Philip Pullman talking about fairy tales would be her dream panel! Sarah Bannan from the Arts Council spoke about using partnerships and mixing up the different art forms – writers and musicians for eg. 7/ When emailing a writer about an event be clear about the fee, the date and what you’d like them to do – Joanne Harris said. You can email writers directly or use social media to contact them. 9/ The Irish government needs to support the arts – book festivals need public funding. 10/ Writers do not make money from book sales at festivals. Joanne Harris explained that to break event at a festival she would have to sell 100 hardback books at £10 per book. 1 in 10 of an audience might buy a book – which means she’d need a theatre of 1,000 people just to break even. Well done to Words Ireland for arranging a most interesting and stimulating day. There will be another in the autumn. They will post a document about the conference on their website in a few months’ time they promised. From the start of this year I have turned down any request that does not pay a fee. If I do not charge for my experience and talent what chance does a young or new writer have of getting paid for their work? I would encourage you all to do the same. Ask for a fair fee. Value your work, writers! Mollie is deeply disappointed that she can’t go to Paris, but there may be other emotions at play in her reaction to the news. Can you name some of these, and say if you think her reaction is understandable? How do you think you’d have reacted to the news? Can you suggest a different and better way to deal with unexpected emotions? Have you ever been away from your family for a long period? Can you imagine what it would feel like to leave your home even for a month? Draw a large heart on an A4 page. Draw a line down the middle to split the heart in two. On one side, write a list of all the things you’d miss about your home if you had to leave. On the other, write a list of the ten things you’d most like to take with you. As you work, think about the choices that refugee children have to make when they are forced to leave their homes, perhaps for ever. Draw some paper dolls, the sort that Mollie used to make with Granny Ellen. [You will find printable dolls and even some clothes with tabs online if drawing isn’t your favourite subject!] Draw or print one for each character you’ve met so far. In each doll-shape, write as many descriptive words and phrases as you can think of for each of the characters. So, Flora’s doll might say ‘disorganised’ ‘irresponsible’ and Mollie’s might say ‘perceptive’ ‘hot-headed’ etc Add more adjectives to the characters as you read through the book. What do you think will happen between Lauren’s twin, Landy and Mollie? Do you think they will get on and become friends? Write your predictions in your notebook and see if you were right when you get to the end. In fact, now might be a good time to write your predictions for all the characters – see if you have the same ideas as the author! Slí an Atlantaigh: Little Bird is a small island off the coast of Ireland and Mollie thinks there it’s boring, boring, boring, with nothing to do and nothing to see, except maybe some tractor-spotting! As you read, make a note of all the attractions on the island, and design a brochure to encourage tourists to visit. And/or choose some part of the Wild Atlantic Way and design a brochure that Fáilte Ireland might use to attract more visitors to our western coast. Once again, Mollie has had trouble sleeping. Can you list the reasons she might be finding it difficult to sleep? Have you ever found it difficult to sleep? Were you worried /excited about something? Can you recall your thoughts as you lay awake? If you’re lucky enough to sleep soundly every night, close your eyes and try to picture yourself lying awake – what might you be thinking? Mollie treasures the gloves her granny had knitted for her eighth birthday. Did you ever get a present that meant a great deal to you? If not, visualise something that you would love to receive on your birthday – no cars or swimming pools, please, try to think of something you might be likely to get from an older relative! Describe this present to your partner/group. Don’t tell them what it is, but let them draw or paint as you describe the colour, texture, shape etc Do your recognise your present in the painting(s)? Can you draw the present more accurately? What might the variety of interpretations tell you about the way we see things? There’s ‘an awkward silence’ after Mollie mentions Alanna’s parents and discovers that they’re ‘not around.’ Have you ever said /asked something that caused embarrassment or awkwardness? Think about some awkward or embarrassing moment and reflect on what gave rise to it. Do such moments teach young people to recognise the importance of care, courtesy and consideration with others? Alanna gives Mollie a potion to help her sleep, but what she really wants is something to make her feel less lonely. Many primary schools use Buddy Stops for the junior classes, others train senior pupils to make sure no-one looks lonely or friendless in the yard. Can you write a formula or magic potion that might help Mollie/ any child feel less lonely in school? Be creative! Flora has always liked to move around a lot and so Mollie has been enrolled in many schools. People react to change with varying degrees of excitement, anticipation, fear, anxiety etc Do you view change as an opportunity or as a problem, or might you have mixed feelings depending on the change involved? Take a few minutes to discuss with your partner/ group. The school uniform Nan brings back is scratchy and beetroot-coloured – (are all school uniforms scratchy?) – but Mollie isn’t used to wearing a full uniform. What is your opinion of school uniforms? You might do a survey on the opinion of your class/ school and/or have a class debate to tease out the advantages and disadvantages of being dressed exactly like all your fellow pupils. You could address your findings to the Students’ Union/Council and/or the Board of Management of your school.